FNF Resident Representative Siegfried Herzog praised the forum as a timely reminder that the challenges of human rights protection cut across borders. Extra tables had to be brought in to accommodate the huge interest in the annual Kapihan (coffee forum) on the Human Rights Situation organized by the Ateneo Human Rights Center (AHRC) and The Philippine Working Group for an ASEAN Human Rights Mechanism (PWG) with the support of the Friedrich Naumann Foundation (FNF) on 15 December 2006 in Quezon City. To do justice to the multiple dimensions of the issue, speakers were invited from civil society, the legislature and the executive, allowing a nuanced picture to emerge. KARAPATAN, a militant human rights alliance, sounded a note of alarm with a report that 2006 saw a sharp rise in the killings of journalists and political activists. KARAPATAN Secretary-General Marie Hilao-Enriquez said “2006 is the worst year for human rights.” She admonished the government for “extra-judicial and politically motivated” killings. General Razon from the Philippine National Police (PNP) asserted that the government was responding seriously to bring the violence under control and root out the culprits. 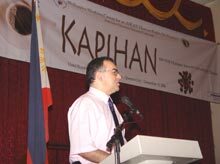 He took issue with KARAPATAN’s figures, arguing that many killings in their list had no political background and of those that did, the NPA was responsible for a substantial share – a view disputed by other speakers. Paulynn Sicam, PWG member and member of the Government Peace Panel, pointed out that, ironically, the peace process has victimized Human Rights, as the debate about human rights violations have become a numbers game. ”The peace negotiations [with the communist guerilla] cannot continue until these human rights issues are resolved,” she said. However, she also questioned KARAPATAN’s report of a high number of killings, citing lack of transparency. Sicam presented the peace panel’s own separate data that supported a more nuanced picture. For the legislature, former Governor Gallardo, chief of staff of Senator Drilon, highlighted the relevance of the Anti-Terrorism Bill advocated by the government. The Senate was presently scrutinizing the bill due to the risk it could poses for civil liberties. Rep. Loretta Ann Rosales struck a conciliatory note, acknowledging the seriousness of the concern about the killings and the perceived culture of impunity while pointing out that the killings could not all be blamed on the central government. She also stressed that there was a need for cooperation with the police and the military to resolve these issues. The development of a modicum of mutual trust was needed, and she gave a strong endorsement of efforts of building such trust. 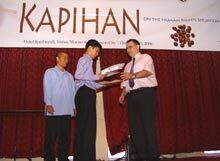 AHRC Executive Director Carlos Medina Jr and FNF Resident Representative Siegfried Herzog congratulate first prize winner Johann Carlos S. Barcena. Despite the disagreement on the exact number of killings, Commission on Human Rights Chairperson Purificacion Quisumbing said that there was a human rights crisis as there was “a perception of the absence of the rule of law.” The problem was not in the laws, but in the implementation. 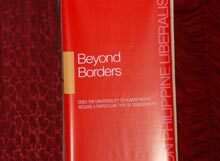 The somber but constructive tone of the Kapihan ended on a positive note with the book launching of Beyond Borders. The book is a compilation of 15 winning entries of an AHRC and FNF essay-writing contest on the question: “Does the universality of human rights require a particular type of democracy?” “Laws do not exist in a vacuum. Human rights and democracy are intertwined and mutually reinforcing,” quoted first prize winner Johann Carlos S. Barcena from his essay. “The Philippines [essentially] has a liberal democracy, with lots of institutions and laws in place to protect human rights. It is worth enforcing these,” he added. “However, it should not be left to the government alone. All sectors of society should do their part [to make sure human rights are upheld]. FNF Resident Representative Siegfried Herzog praised the forum as a timely reminder that the challenges of human rights protection cut across borders, as each society grapples with the need to balance the demand for security with the rights upholding individual liberty. If you wish to receive a free copy of Beyond Borders: Does the Universality of Human Rights Require a Particular Type of Democracy, please send us an e-mail with your name and mailing address.